The secret behind every impressive bowl of ramen is patience. Since leaving London, I’ve desperately craved getting my fix. Before Tonkotsu, an authentic ramen bar was hard to come by here in Birmingham. I love cooking and I’m a bit of a whizz kid in the kitchen, however making my own ramen, the real authentic stuff doesn’t appeal to me as I’m simply not that patient. That silky, mouth watering pork broth that simmers slowly for over over 10 hours takes self-restraint and the kitchen wizardry, I simply do not possess. Don’t get me started on those eggs I’ve been wanting to try and make ajitsuke tamago (the Japanese marinated soft boiled egg that often accompany ramen) for ages! September arrives and I hear that Tonkotsu are opening their 6th branch in Birmingham. 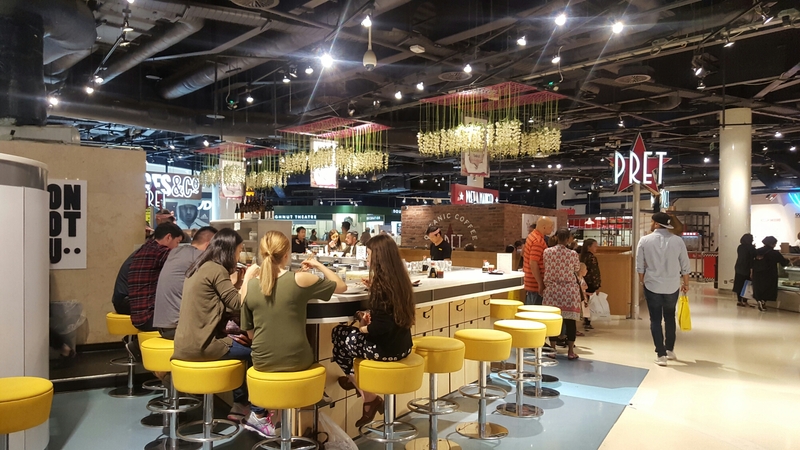 With a counter already positioned in Selfridges London, I guess it was an obvious choice for a lease to test the Brummie waters. 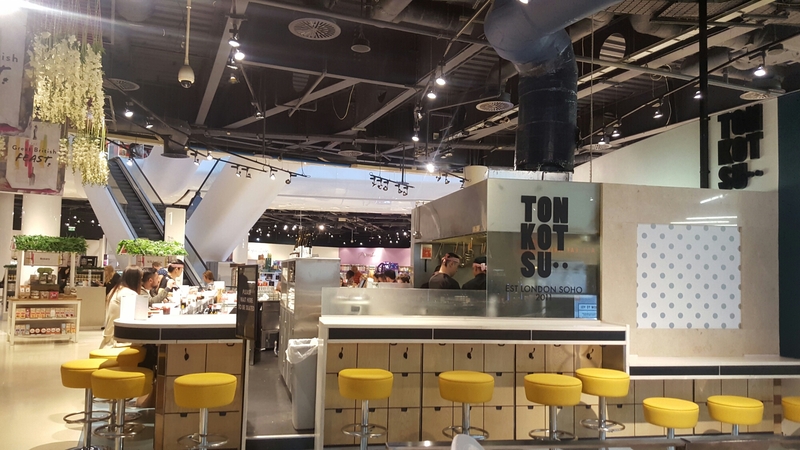 I was invited by co-owner Emma Reynolds to come and try Tonkotsu for myself. To be honest, besides airport terminals and perhaps the very occasional train station, I don’t do shopping centre eating. Not out of snobbery, just I hate being rushed when it comes to food. I am the slowest of eaters. I visited on a late Sunday afternoon, it’s ticking nicely. There are only a few diners, but within a few minutes of us sitting down it begins to get busy again. There isn’t an entrance, so no formal place to expect to be greeted. Once noticed, we are greeted with a warm welcome and we plop ourselves on the bar stools that overlook the open kitchen. It smells delicious, I watch in awe as other diners slurp their noodles, I’m desperate to try some. The menu is split up into sides, ramen and rice and drinks. There’s also a chicken karaage burger. We started off with a couple of beers, The Travel Boy went for the Kirin Ichiban and I went for a Sapporo. Both were very refreshing, but I liked my choice of the Sapporo better as the bubbles were more refined. Just my personal taste! We decide on a few starters to share and ramen to accompany. The food comes out as it’s made. The tenderstem broccoli was served with a tasty homemade Japanese mayo and still had a good crunch. The chicken karaage was crispy and well seasoned in mirin, soy, ginger and garlic them fried. It was really moist and juicy on the inside. We also had the king prawn katsu, served with a Tonkotsu sauce. Expect to find kimchee, pickled cucumber and squid on the sides. For our mains, The Travel Boy went for the chilli chicken ramen and I went for the house Tonkotsu ramen. The chilli chicken ramen had a chicken and sea salt stock, chicken and noodles. It also had the house eat the bits chilli oil, resulting in a fiery kick. The manager mentioned that the chicken ramen was the most popular option in Birmingham. The Tonkotsu ramen felt like the natural choice for me. An impressive 16 hour pork broth made up of pig bones and lardon fat, creating a delicious soup that I would happily enjoy by itself. It’s then topped with thin noodles, pork belly strips and a seasoned egg. The egg yolk is amazing and I could easily have ordered and extra one for my ramen. We didn’t go for any desserts and enjoyed quite a leisurely slow paced lunch. It didn’t feel rushed at all, perhaps because it was late Sunday afternoon. Be warned that the ramen bowls are very filling! One thing that excites me as that they do takeaways, if you’re based in town consider grabbing a container of freshly made ramen to eat at your desk over lunch. It was really nice to see the new restaurant so busy and I do hope they consider staying in Birmingham once their lease expires. I was invited to sample the new restaurant and the meal was complimentary. My writing, my honest views. Previous Post Event: Birthdays, hip hip, hooray!